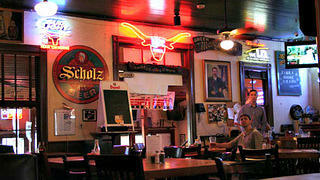 The Scholz Garten has been an Austin institution since the day the original bar opened its doors in 1866. Pop quiz: What do all of the following things have in common? Bunsen burners, crop rotation, kindergarten, tubas, sausage, Christmas trees, the Easter Bunny, Levi’s (and blue jeans in general), and beer gardens (or biergartens). If by “tubas” your mind was already running to the fact that all of these are contributions made to our glorious society by German-Americans, then chances are your last name is something like Anheuser or Busch. If you realized at any point that several of these things were vaguely German, well, that’s good enough. But back to the last item on that list: beer gardens -- and Scholz Garten in particular. The interior of Scholz Garten offers an authentic, old-school Austin feel with a flare of the old country. Founder: August Scholz, German immigrant, Confederate veteran, and all-around good guy. Hours: 11 a.m. to “late night” (a good sign) every day. History: The beer garden was founded as a simple bar in 1866 by August Scholz and pretty much immediately became a favorite of local Bavarian and Prussian immigrants to the Austin area. 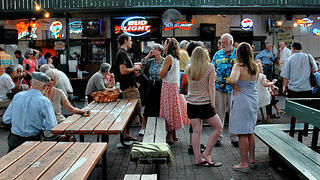 The beer garden itself came a few years later and has played host to outdoor music and entertainment ever since. Though Scholz died in 1891, his son, and later, the Lemp Brewery carried on the tradition of the place. In 1908, the property was purchased by a local German singing group, and has remained under their ownership ever since, with a lease out for management of the bar and beer garden to a succession of proprietors. 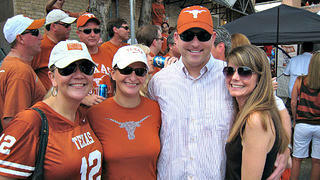 The beer garden has long been a favorite spot for the University of Texas at Austin fans to prepare for Longhorn football games. Building Type: A fairly nondescript brown brick building, which actually kind of makes it better. Claim to Fame: Cheap, lager style beer. A combination of German food and barbecue. One of the best spots to gather before University of Texas at Austin home football games. You’re Having: The Scholz Schnitzel, a pork loin wiener schnitzel with queso and pico de gallo with sides of Cajun rice and sauerkraut (really the best of both worlds here). Wash it all down with a few Franiskaner Dunkels and you’ll be all set. Best/Worst Yelp Review: “Always heard about it now I know great place” -- Louise D.